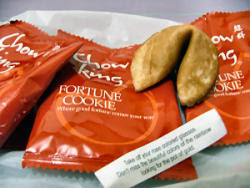 I had lunch at Chowking the other week and I noticed that they were advertising fortune cookies beside the counter. The last time I had a fortune cookie was when I was a kid. So it was exciting to be able to crack one open, eat the cookie and get your fortune. I can't quite remember the fortune I got but it was a safe and general message. The funny thing was that it said that I won't be able to achieve anything by sitting down. And where was I when I was reading that ? Sitting down inside the Chowking fastfood restaurant. So I guess it's tough luck for me huh. Before leaving, I bought another one to bring home for my mom. When I gave it to her, she opened the wrapper and broke the cookie. The strangest thing happened. There wasn't any fortune inside. I had the impression that every fortune cookie had a fortune. So it seems that this is one unlucky fortune cookie, not living up to its essence. It's even worse for the recipient awaiting and expecting a fortune, not to receive one and could mistakenly be interpreted as unworthy of receiving a fortune. I just had three fortune cookies in a row, the first had a message, the second did not and neither did hte third. I am a fortune cookie fan, and this have never happened to me. BUT TWICE IN A ROW! I was shocked. now im just waiting for bad things to come. So it's not just me. There are empty fortune cookies that exist. I would've wanted a fortune whether good or bad as long as there's something to look forward to inside the cookie. You know I buy fortune cookies because of the fortune and not because of the cookie. The cookie is packaging for me and a bonus treat. The real treat for me is the "fortune". Could it be just Chowking ? Interesting to find out and hear from others who've had fortune cookies from elsewhere. And speaking of fortune cookies, where else in Manila can you buy fortune cookies ? I have no idea.